There are a variety of juicers available in the market but finding the best suitable according to your family needs can be time-consuming. Some may prefer juices of citrus fruits only while some may be looking for a juicer that would be able to do vegetable juicing as well along with fruits. Based on these parameters we came up with the following 5 best juicers available for your family. Each of this juicer is best in class and you can opt for one as per your priority. Sujata Powermatic juicer is one of the few juicers which is powered with a 900-watt motor and eases your task of juicing fruits or vegetables. 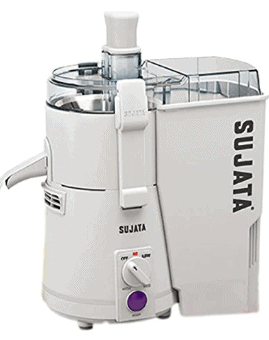 Sujata Powermatic juicer comes up with two-speed control along with an on-off button that allows you to control the juicing process. You can adjust the speed of juicing as per the juicing material. For citrus fruits, you can run juicer at low control which is enough to get your juicing done. Its motor is equipped with double ball-bearings and has a shockproof body design that allows you to use this juicer for up to 90 min continuously. Its high-speed motor rotation frequency of 22000 rpm makes the juicing processing quite fast and extract every drop of the juice from fruits or vegetable leaving the pulp completely dry. Sujata Powermatic juicer comes up with detachable pulp container which enables you to have an uninterrupted juicing operation to extract higher yields. Whenever you want to dispose of the pulp all that you need to do is to detach the pulp container and then it can be easily emptied and cleaned. Philips viva collection juicer is equipped with 700 Watt motor, which eases your task of blending, mixing and crushing effectively. Its powerful motor allows to get the juicing done in one operation go thus minimizing your effort and time of repetitive juicing. Philips viva collection juicer comes with high-quality build design and the entire body has aluminium built, which gives this appliance an appealing look. This juicer comes up with pre-clean functionality which rinses away the unwanted fibres very quickly. Additionally, the polished sieve of the juicer and smooth surface minimizes your cleaning effort. Philips viva collection has the innovative juice extraction system which makes it capable of extracting two litres’ juice in one operation. It has a 75 mm extra-large feeding tube allows you to juice even large fruits and vegetables like apples, carrots and beetroots without pre-cutting. The unique thing that distinguishes this juicer from its peers is easy disposal system for pulp. All the pulp will get collected in the pulp container of your Philips juicer. This Philips HR2771 juicer is for the people who prefer citrus fruits juice like oranges, lemons, grapefruit, pomelo and limes etc. Philips HR2771 juicer is designed with a two-way rotation mode that allows you to extract the maximum amount of juice from your fruit and thus minimizing wastage. Juicing is also easy and convenient with this juicer as everything from juice, to the pulp, to fruit seeds are separated in the Philips citrus press juicer. 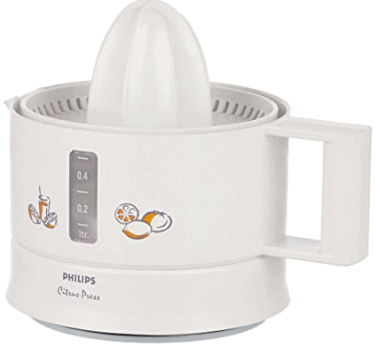 This Philips citrus press has provision for juicing both big and small fruits because of its double cone feature. All that you have to do is to press the fruit on the cone and juicer will extract the maximum amount of juice from your fruits. This citrus press also comes with a pulp selector option that helps to extract juice as efficiently as possible. Philips HR2771 juicer cares for your kitchen cleanliness and so as it includes drip stop feature that stops the dripping of residual juice from the spout after a juicing session. This juicer can effectively store up to 500ml juice at a single time in the jar. 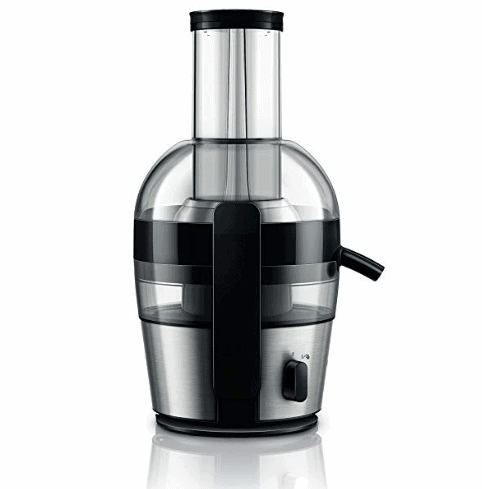 A nice feature present in Philips HR2771 citrus press juicer is its low consumption of power. With consumption of only 25 watts, this juicer won’t be any kind of burden on your electricity bills. You can use it on daily basis. As most of the parts in the juicer are detachable, you can pour out the juice and clean the remaining parts easily without much effort. This Philips 25 watt citrus press does not produce any sound during juicing operation. With its low power use, powerful juice extraction and ease of use, this juicer truly deserve a place in your kitchen. Philips viva HR1832 juicer is the solution to all your worry that you might be having with your previous juicer because of low juicing speed or juice extraction. Its features like high juice extraction, fast cleaning within 1 min, direct serve and that too in almost half size give it an edge over others. 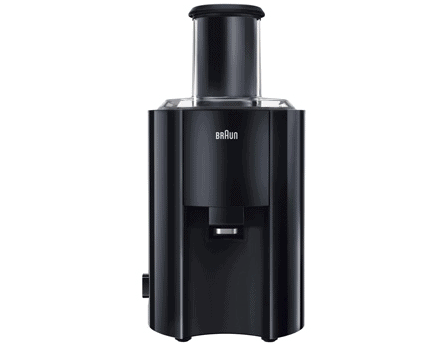 Philips viva HR1832 juicer has compact and glass body design. It comes with an innovative QuickClean extraction system which allows you to make up to 1.5L of juice in one go without needing to empty the pulp container. With this juicer, you can use your own glass (Max 12cm height). Place the glass directly under the integrated tap and you are ready to juice. Cleaning any juicer can be a complex task but not with Philips viva HR1832 Juicer. Its QuickClean polished sieve, integrated pulp container and smooth surfaces make your cleaning an effortless task. Usually, a lot of pulp fibres get stuck in the sieve, which makes it very difficult to clean. Because of smooth of sieve surfaces, you can wipe away the fibres simply with a standard kitchen sponge. Since the lid and the pulp container are transparent so you can see your fruits and vegetables being juiced and when the container is full which means it is time to empty it. Philips viva HR1832 juicer comes with a drip stop feature which prevents the juice from dripping and helps you in keeping your kitchen clean. Barun multiquick 3 J300 is an elegant and compact juicer appliance for your home. Its high-performance juicing system makes the most out of your fruit. It only takes 15 seconds to make a refreshing, healthy glass of juice. You might have seen foaming is formed while making and pouring juice due to which you may have to wait for a few minutes before serving. Barun has very well understood this common problem and eliminated that in this juicer with foam separator. The perfect combination of foam separator and stainless steel micro mesh sieve in Barun multi quick 3 J300 removes any foam, ensuring a very easy separation of foam and juice during the pouring. You always get ready to serve juice thus saving your time and effort. A smaller feeding tube is a problem with some of the good juicer available which require you to cut the fruits or vegetables in small pieces first. This might not be convenient always. Barun multi quick 3 J300 comes with a large feeding tube which is perfect for processing whole fruits. Simply throw in large chunks or whole fruits and let the juicer transform your ingredients into a delicious beverage. To prevent any excessive spillage Barun multi quick 3 J300 comes with a drip-stopper function which ensures that your kitchen remains clean – with one push of the anti-drip button. Simply press to avoid messiness and spills. 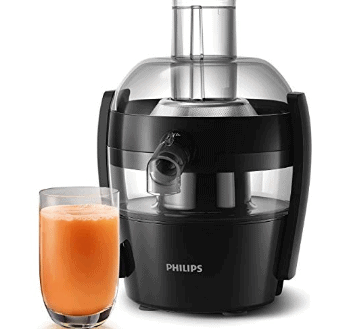 Out of all the juicers,Philips viva HR1832 juicer and Barun multiquick 3 J300 juicer yield the maximum amount of juice. You may prefer Philips viva HR1832 over Barun considering cost factor. If you are looking for juicer mostly to be used for citrus fruits then Philips HR2771 citrus press juicer can be your preferred choice. It is easy to use, low power consuming and does not require you to cut the fruits in pieces. Philips viva collection juicer has XL feeding tube and high juicing capacity making it suitable for medium to large family.